A celebrated Cameroonian writer who wrote a piece critical of the government’s handling of a separatist crisis in its Anglophone region was detained at Douala airport on Thursday, his wife and lawyer said. 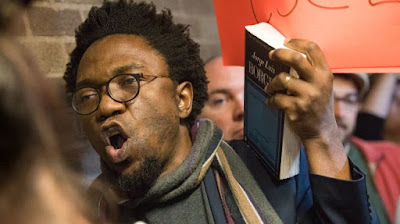 Patrice Nganang, a prize-winning poet, professor and author who lives in New York, was due to board a Kenya Airways flight to Nairobi and then onwards to Harare to join his wife on Thursday but never arrived. After 24 hours of trying to track him down, Nyasha Bakare said he had been found by his lawyers at a government detention center in Yaounde, the capital. “He’s apparently OK. That’s the main thing,” Bakare said, adding that the authorities appeared to be preparing for a legal hearing. A spokesman at the government’s communications department was not immediately available to comment. Last week the government ordered thousands of villagers to leave their homes in the Anglophone Southwest region as it deployed troops to root out armed separatists. The move marked an escalation of a year-long crackdown on peaceful protests in the English-speaking western part of the country that has killed dozens of civilians and forced thousands to flee to Nigeria. “Are we going towards the forced relocation of populations and the creation of (refugee) camps?” Nganang wrote in Paris-based Jeune Afrique on Dec. 5, describing this as “offensive”. “So bilingual Cameroonians can be enemies in a country whose president has never said a single speech in English?” he added. President Paul Biya has ruled Cameroon since 1982 and plans to stand for another term next year. The separatist stirrings add to headaches over the economy slowing sharply since 2014 and attacks in the north by Islamist militant group Boko Haram which have strained the military. Biya’s 35-year rule has grown increasingly intolerant of dissent, with opposition activists, journalists and intellectuals routinely arrested and sometimes charged. In April, a Cameroonian reporter for Radio France International was jailed for 10 years by a military court on terrorism charges, including for failing to report acts of terrorism to authorities. The verdict attracted international criticism.